Ireland is not only green on the land. 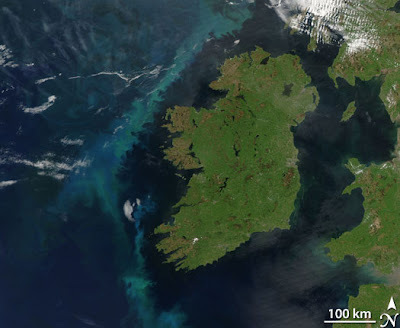 This photo was taken on June 2, 2006 by the Moderate Resolution Imaging Spectroradiometer (MODIS) on NASA’s Aqua satellite. The ocean is normally black in true-color, photo-like satellite images such as this one, but a large phytoplankton bloom lent the water its brilliant blue and green hues. Phytoplankton are microscopic plants that grow in the sunlit surface waters of the ocean. When enough of the plants grow in one place, the bloom can be seen from space. Aside from coloring ocean waters, phytoplankton play a large role in sustaining ocean ecosystems and in global climate. The tiny plants are the base of the marine food chain, and places where blooms are frequent tend to support a thriving marine population. Since the plants need nutrients like iron to grow, fertile waters are often near a continental shelf in areas where cool water from the ocean’s depths pushes to the surface. This upwelling water carries with it nutrients that had settled to the ocean floor; the nutrients allow the water to sustain large phytoplankton blooms. Phytoplankton influence global climate by regulating gases in the atmosphere. Like all plants, phytoplankton absorb carbon dioxide and release oxygen as they grow. When the plants die, they sink to the ocean floor, carrying the absorbed carbon with them. Over the course of the Earth’s history, the oceans have become the primary sink for atmospheric carbon dioxide. Since carbon dioxide is a greenhouse gas (it traps heat at the Earth’s surface), the Earth would be a much warmer place without phytoplankton. Above story courtesy of NASA. I bet there's one aspect of the hallowed "green of Ireland" that you haven't thought about! Happy St. Patrick's Day! Further reading: here is NASA's page.